On Saturday, Sept. 15, thousands of Californians will descend on the state's beaches, parks, and riverbanks to collect trash. 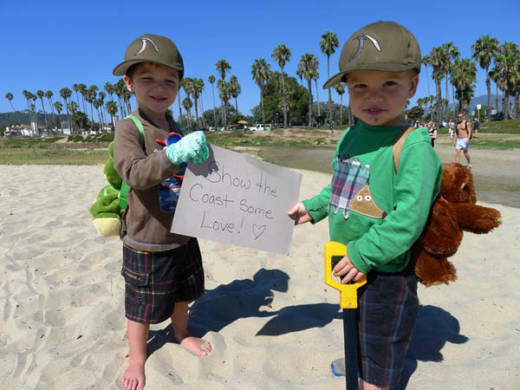 Their efforts are part of the annual Coastal Cleanup Day, a global campaign to remove debris from the environment. During last year's Cleanup, which falls on the third Saturday of September, California volunteers picked up 800,000 pounds of trash and recyclables in only three hours. The collected trash is then tallied to raise awareness about major pollution challenges. Food wrappers, lids, paper and plastic bags are among the most common items collected, in addition to the number one item picked up: cigarette butts. Volunteers can head out to any one of nearly 1,000 cleanup sites throughout the state, including inland areas where trash can be removed before it reaches the coast. Want to participate? Find a cleanup spot near you using the map below. Volunteers who are 18 years old or younger must bring with them a parent-signed waiver, found here. For groups of 20 or more volunteers, call (415) 561-3077 or email volunteer@parksconservancy.org to register. Keep track of your efforts and help researchers collect environmental data by downloading the Clean Swell app. The data will be sent to the Ocean Conservancy's ocean trash database, which helps identify trends and delivers a snapshot of global ocean trash for researchers. The app keeps a record of your cleanup history, including total distance cleaned, allowing users to see their environmental impact and share it on social media.